Five years after the presentation of the Fiat 500 and 55 years after the début of the historic 500, Fiat is again leveraging the 500 theme, this time it is for a Serbia-built mini MPV that replaces the B-segment Fiat Idea and Lancia Musa in the line-up. Five years after the presentation of the Fiat 500 and 55 years after the début of the historic 500, Fiat is again leveraging the 500 theme – this time it is for a Serbian-built mini-MPV that replaces the B-segment Fiat Idea and Lancia Musa in the FGA lineup. 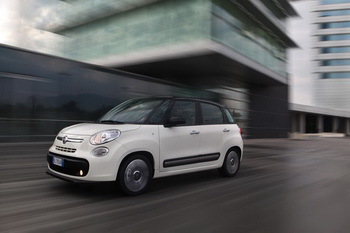 Fiat has held the media presentation of the new 500L this week. 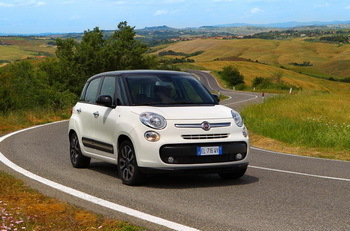 The 500L, which is part of a plan to extend the 500 ‘family’ – aping the overall direction of BMW’s MINI brand – comes at a critical time for Fiat, which will be hoping that it can become much more than just the niche players the Idea and Musa were. It is based on SUSW (‘Small US Wide’), a derivative of the Fiat Punto’s ‘Small’ platform which has been widened for U.S. market application. 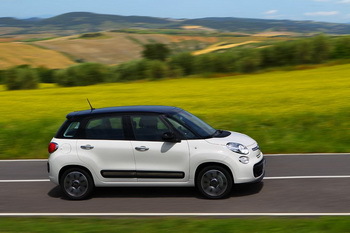 The Fiat 500L can be ordered in Italy and on the major European markets starting from July. The commercial launch is scheduled in Italy with an Open Day on the first weekend in October, to then progressively expand to all the other markets. 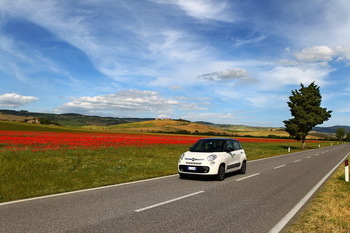 Altogether, during 2013 the Fiat 500L will go on sale in more than 100 countries around the world, including the United States. It is also possible to view all the information supplied by the brand new eco:Drive live software on the 5" touchscreen in real time. 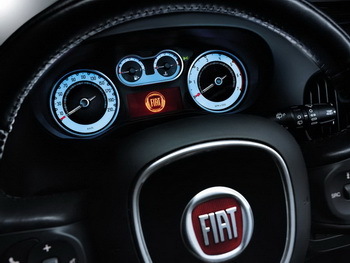 The software is the latest evolution of the eco-friendly application developed by Fiat in 2009. Today there are over 80,000 eco:Drive users. The system can analyse your driving style thanks to the data collected on the car and provide personalised suggestions in order to reduce up to 16% of fuel consumption and CO2 emissions. 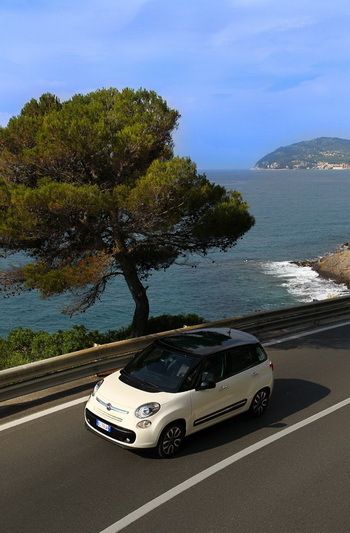 With the 500L eco:Drive becomes LIVE, meaning you can receive feedback about your driving style in real time, thus attaining immediate fuel consumption and emission reductions. It is also possible to save the data of every journey on a compatible USB memory stick and smartphone. By analysing the results on a PC and receiving tailored driving lessons, emissions can be reduced up to 16%. The Fiat 500L is produced at the Kragujevac (Serbia) plant, inaugurated last April after three years of intense and continuous work carried out to upgrade the infrastructures and restore the buildings, with new roof coverings, new production departments, reclamation of lands and installation of advanced machinery and production systems. Over 1 billion Euros have been invested from 2010 to today, in addition to Fiat's best professional resources. Every day 2500 workers and suppliers took part in the plant's reconstruction. In addition, 1,100,000 hours of staff training were provided to create a new industrial culture. Besides, its great engineering tradition and culture, and also the presence of universities and technical schools, reinforced the decision to invest in Serbia, a country where Fiat has been present in collaboration with the Zastava group since long ago in 1953. The new Kragujevac plant production capacity exceeds 700 cars per day thanks to the new design and structure. With its compact, flexible and modular structure - it can indeed produce various models - the industrial site was built to last for years, to be productive and competitive, in addition to abiding by the principles of World Class Manufacturing, the production system applied throughout the Fiat Group. New technological standards have been applied for the production of the 500L in order to support other production cycles (flexibility), to make maintenance easier and to reduce energy consumption (simplicity) and to assure quality (sturdiness). More specifically, every production station has been designed taking all the essential parameters into consideration. Those parameters include safety; quality, with over 1,900 controls on the line; logistic flow, developed on the basis of the operation station; efficient maintenance; environmental sustainability by reducing consumption; and ergonomics, which cuts stress and fatigue factors to a minimum. 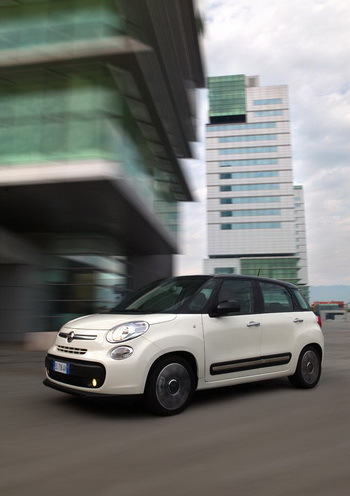 The Fiat 500L is also Large in terms of quality. As the innovative metrology room, where all the components are physically taken to be controlled, measured and tested, demonstrates. Nonetheless, product quality also depends on quality of the process in terms of geometry, and on a rigorous execution. The walls, roof and floor of the coach building department are all assembled with precision. The coach building department of the Serbian plant, for example, was studied to have a sound geometric structure of utmost precision by adopting a method and a level of well-reasoned automation. As they have been designed for more than one life cycle, the systems are large and simple to make maintenance easier while at the same time boasting high performance and reliability. What's more is that they stand out in terms of flexibility. They can house a number of models, including various platforms, without having to interrupt the production line. A solvent methodology for "high solid" metallic paints has been introduced for the first time in the paint shop. Interiors are painted by hand while the exteriors are painted by robots, and then go to the solvent-based GAS oven booth for transparent coating. Let's move on to the assembly line, where the level of complexity is amazing with more than 5,000 components to manage and have delivered to the line in the correct quantity, at the right place and at the right time. The professionalism of the personnel is essential here. In fact, experience and manual skills add value to the product. This is why the operation station and the entire logistic system have been defined based on the movements of the hands. All this promotes quality in an integrated fashion. The Serbian plant was built in keeping with the concept of sustainability, both by reducing negative effects on the environment in industrial production by way of planning attentive to environmental issues and workers, and by implementing the FIAT Biodiversity Value Index as the ratio between human activities and biodiversity. The planting of over 1000 indigenous trees in the plant area together with the employees' children and the creating a bio lake that is the home to many dying species, for example, are proof of that. 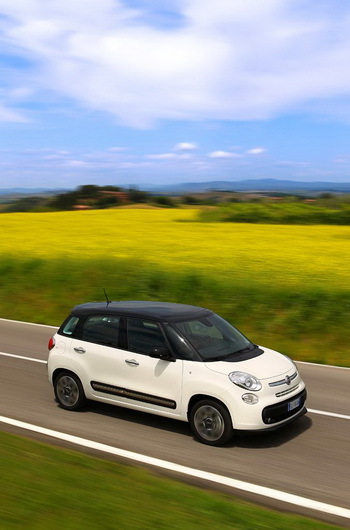 Everyone can find the Fiat 500L that best suits his or her demands and tastes. At launch, 11 exterior body colours, 3 different shades for the roof (black, white or selected body colour), 4 trim levels (Pop, Pop Star, Easy and Lounge), 3 rim colours (black, white, grey), 3 engine versions and 7 different interior configurations in addition to 140 accessories specially created for the model are available. In Italy, the range starts from the Pop version, which comes with standard equipment bound to appeal. When it comes to safety, for example, there are two front airbags, two window bags and two side bags in addition to the ABS with EBD, front headlights with DRL (Daytime Running Lights) function and the sophisticated ESC system complete with the ASR, Hill Holder, MSR, DST and ERM functions. In the same way, the following are included as standard equipment to enhance comfort: steering wheel adjustable in height and depth, electric front windows, Dualdrive electric power steering with City function, driver's seat adjustable in height, central locking system and remote control for opening the doors. The Fiat 500L Pop trim level also offers the sliding split (40/60) rear seat accommodating 3 passengers that can be closed using the "Fold&Tumble System" function, handy storage compartments on the dashboard (one open and two with flap closing) and the useful "magic space" cargo. Completing the equipment of this version are the Start&Stop system (on the 0.9 Twin Air and 1.3 MultiJet), audio set-up with 4 speakers and 2 tweeters, rear window wiper and Fix&Go system. Compared to the previous version, the Pop Star trim level is richer owing to the protective side strips with stainless steel insert, the electric door mirrors with demister painted in the body colour and the 16" alloy rims in the colours of grey, white or black. 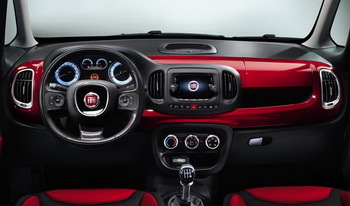 Added to the already full set of standard equipment of the 500L Pop, the Pop Star version also offers the manual climate control system with pollen filter and cruise control. Then for those who want the most in terms of functionality, there are the Easy and Lounge trim levels. The is in particular the right combination between end price, good looks and technical equipment. Compared to the Pop version, it offers the added Cruise Control, manual climate control system, electric door mirrors with demister, CD/MP3 radio with 5" touchscreen, also with digital radio (optional), leather steering wheel with radio and UConnect controls and leather gear knob. The top of the range Lounge version comes with all this equipment and more: 16" alloy rims, protective side strips with stainless steel insert, fog lights, automatic headlights, rear armrest, rain sensor, internal chromic rear-view mirror, fixed-glass roof, accessorised front seats, rear electric windows, automatic dual-zone climate control system with pollen filter. Finally, depending on the markets and outfit, numerous optionals and accessories are available that, for the customer's convenience of choice and economic benefit, can also be purchased in specific Packs. 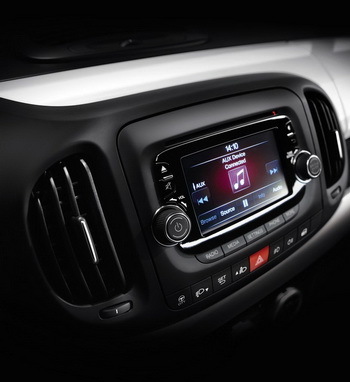 The many contents available on request include the UConnect CD/MP3 radio with 5" touchscreen, parking sensors, 17" alloy rims, knee bags, heated windscreen, Premium Beats audio system, Lavazza coffee machine, heated front seats, electrically controlled Skydome roof and baby surveillance rear-view mirror.